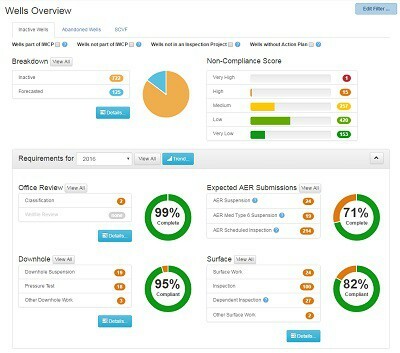 ClearCompliance is an online software program to manage regulatory compliance of inactive wells and pipelines. It is a single data repository tool with built-in data validation, which applies a set of industry standard rules across all business units / assets, and significantly reduces risk and enhances reporting and forecasting abilities. The software offers one simple to use solution of a single data management system designed to notify and schedule work, advise on requirements that minimize risk, reduce costly over-sights and allow ease of access across business units. Every well that is licensed to a subscribing company is automatically loaded and maintained in the database, allowing users to manage their inactive wells to ensure they are compliant with local regulations. Optional Field Tablets are available which allow for convenient field site inspections in a simple to use check-list format. Once you try it, you will wonder how you ever managed your wells without it! Call (403) 508-7836 or please fill out our form below to request a consultation. For a detailed demonstration of the product, each of its modules and capabilities, please feel out the form below and one of our representatives will be in touch to schedule a meeting.